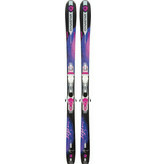 Comfortable control across any snow conditions, the LEGEND W 80 offers smooth, all-mountain versatility. Our Active Wood Core and Powerdrive construction offers a balanced, natural flex from tip to tail for comfortable, responsive ski control in any snow conditions. The progressive five-point sidecut and rocker profile supply natural versatility and a large balanced "sweet spot" for instant comfort in any terrain!